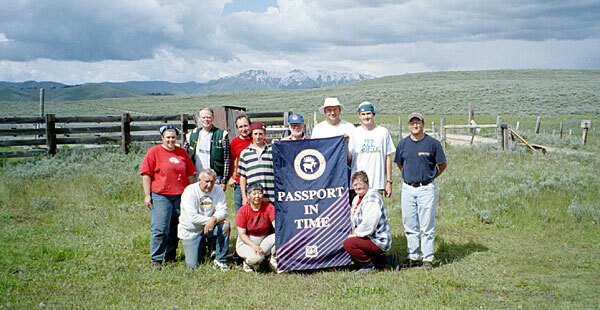 The Moores Spring archaeological site is on the edge of the Camas Prairie in south-central Idaho. Ethnographically, both the Shoshone and Nez Perce used this area, where they traded goods, sought companionship, and harvested camas plants (Camassa sp. ), among other activities. The site is in a geographic interface be tween the lower Snake River Plain to the south and the mountainous area just to the north. The site was originally thought to be a short-term camas-processing station that was used during the last 1,000 years. Several research questions were proposed: (1) What is the surface and subsurface extent of the site? (2) How old are the cultural deposits? (3) Does the artifact assemblage suggest plant processing or some other activity? (4) What does the presence of ground stone, bone, shell, and pottery suggest regarding subsistence and settlement patterns? Over 25 volunteers from eight different states (Arizona, California, Idaho, Illinois, Oregon, Utah, Virginia, and Washington) contributed a total of 1,184 hours to the project over the two years. Of the 16 field days in 1998, it rained at least eight of them! Marlena Sackett and Boise State University anthropology students Leisa Hamilton and Natalie Starkovich were among the volunteers who braved the weather to lend a hand the first week. During the second week, the rains let up a bit, and a new group of volunteers came to help. Scott and Larry Robison and Rick and Vaden Thurgood were first-time PIT volunteer father-and-son teams. Also joining us the second were Frank Crosser, Don and Caroline Sittler, and Carl and Jan Smith. During the 1999 project, the weather did a complete 180° turn to sunny and hot! While some of the volunteers thought it was uncomfortable, FS personnel, remembering the previous wet season, thought it was wonderful. Friends Sandra Brucker and Ruth Eickenberg traveled from Bloomington, Illinois, to participate in the project and were surprised to arrive on an NF in Idaho and not find a single tree in sight (we were on the Camas Prairie, remember?). Others who joined us in 1999 included Skip, Bonnie, and Nicole Beaudoin; Pamela DeBarruel; Jim Hust; Glenn and Evelyn Smith and their grandson Thomas; Lorraine Keaveney; and Beth Oscanyon. Through the help of volunteers, we are beginning to answer the research questions we posed. 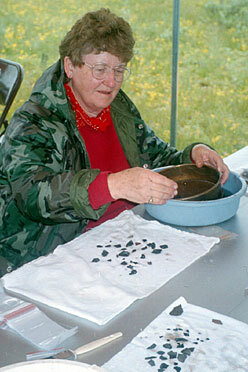 Projectile-point types recovered during the excavation have pushed back the dates from 1000 to 2000 B.P. or possibly even earlier. The limited amounts of ground stone and large quantities of projectile points and lithic debitage recovered suggest that the site was not primarily a plant-processing site, but perhaps a short-term camp where retooling activities and limited plant processing took place. The volunteers who participated in the Moores Spring Test Excavations have contributed their labor, expertise, and willingness to help preserve the past on NF lands. They have helped the Boise NF conduct research that might not otherwise have been possible. To all the volunteers who participated on the Moores Spring Test Excavations project and to all PIT volunteers in general—our hats are off to you!